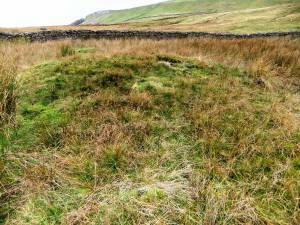 Record Name Akrigg Pasture Burnt Mound Site 3. Record Description This medium burnt mound, is located in rushy marsh and is 7m diameter and 1m high approximately. This site is the third of an open cluster of four burnt mounds situated in Askrigg Pastures above and below the western end of High Straights Lane. Additional Notes First reported by Laurie T.C., 2004. 'Burnt Mounds in Wensleydale and Swaledale.' in R.F. White and P.R.Wilson Eds. Archaeology and Historic Landscapes of the Yorkshire Dales. For details of the landscape setting of this site, see photographs. Image 1 Description Askrigg Pasture Burnt Mound No 3.